biNu combines a news reader, Facebook and Twitter clients, eBook reader, free SMS and Email sender and Google and Bing search into a single app. On my test Motorola Rambler Binu worked fairly well but the text font was ugly and hard to read. It looks better in the mobile Java emulator I used to make the screenshot and hopefully will look OK on other phones. 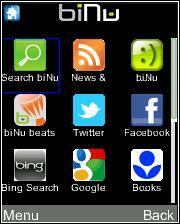 The app “biNu” (181 KB) is ready to download or send to your phone as filename:”binuC”. how to download apps and games? pls help me. have i475 got java error upon installation during verifying classes! You were not kidding about those fonts . I downloaded it mainly for the ebook reader , and it is at best difficult to read . Not to mention that booksinmyphone.com has a much more wider selection for my Innuendo .